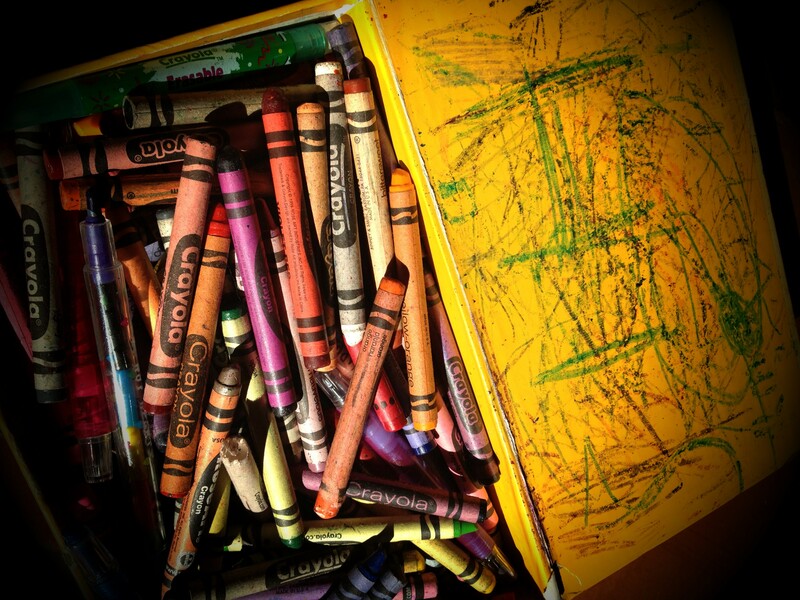 When Davis was born, someone sent a gift that included Crayola Wizard’s Giant Box of Crayons. 120 colors. I thought he’d never be old enough to use them. He was an infant. It made me smile. And I tucked them away. About a year later, I bought fat crayons for him. And my sister-in-law sent him Beeswax Block Crayons around the same time. Perfect for little hands. Sidenote: these block crayons are incredible for plane rides. No rolling. I still have ours. Love them! I don’t recall when I opened the Wizard’s box. But I can picture the kid’s face upon seeing so many colors. So many choices. And he loved to color. Loved it. I never bought coloring books, though we did have some. We encouraged him to scribble and imagine and play. The thing about coloring books is that they’re about filling in spaces, not creating. And he loved to create. Over the years we threw out used up crayons and bought more. Rinse and repeat. And this is what we have today. The box filled with I don’t know how many crayons. Can’t you just smell them? This morning, we went school supply shopping. Yes, I know we’re the last people to do that. I could tell by the shelves at Target. Back at home, I sat down to organize the drawers of supplies. I tested all the pens. Tossed some. Tested the markers. Tossed most. After all, many were washable markers that we’ve probably had since Max was in kindergarten. He’s in high school this year. No wonder the ink dried out. Recycled are the loose leaf papers with wide rule. The spiral notebooks that were mostly used. And the old folders. But I couldn’t part with the colored construction paper. We all mark time in different ways. For me? Today? It’s about the fact that my boys don’t think we need to keep the crayons. Ahh the smell of crayons and construction paper…brings back memories. Def a save!